This class includes snails and slugs. Snails have left the best fossil record. Snails are found in marine and fresh waters and on land. They are the most diverse and abundant class of mollusks. They secrete a single, spirally coiled shell, and their anatomy includes a head, eyes, and sensory tentacles. Snails move along on a foot and feed with a toothlike organ called a radula. When disturbed, snails retract into their shells, and many have a cover (operculum) that can be positioned over the shell opening (aperture). 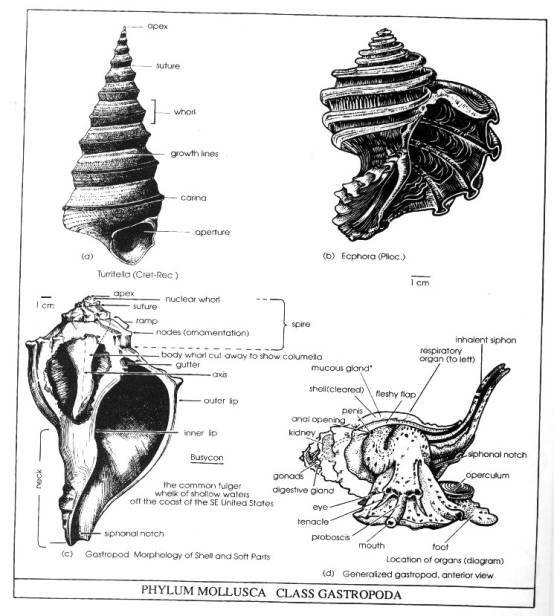 Snails have only one gill, and land-living snails use the mantle cavity as a lung for obtaining oxygen. Snails feed by grazing algae off the sea bottom, deposit feeding, or filter feeding. Some snails are predatory, scraping a hole in the shell of the prey and eating the soft tissue. One snail (the pteropod) has a thin shell and is planktonic.